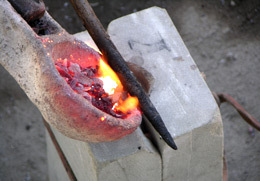 Last places are available for the Workshop Smiths in Bronze Age Europe, planned with a pedagogical and hands-on approach with the aim to provide a reference guide for skill experts, craftsmen as well as managers dealing with Bronze Casting presentations in Archaeological Open-Air Museums. The workshop will take place on Friday 13 and Saturday 14 April at Museo Civico Archeologico Etnologico di Modena in Italy. All lectures, workshops, lunches and site visits are included, while accommodation, travel and dinners are at own expenses. See for more information our detailed program. Please, contact before the 28th of March alessia.pelillo@comune.modena.it.